Join the discussion on our forums! Come discuss Kabal Crystal Runner over in our dedicated Kabal Crystal Runner discussion topic. Costs (2) less for each Secret you've played this game. "Listen, I can cut you in on a little of this premium mana, but you can't tell my boss." With all the goodies secret mage has gotten, I think this could safely go down to "Costs (1) less for each Secret you've played this game." and still be viable. The value is kind of crazy when the Mage plays three secrets and this girl for free. She's so cute. I can't stand it. IT'S A TRAP! Tentacles are male species' thing. Un'goro brought new life into our delivery girl, she's awesome in the new Secret mage. Is that a reference to the Late for School anime trope? I don't see toast in her mouth, so probably not. Aww she's so adorable. I have a weakness for our lovable Draenei aliens. Not to mention I love the fact that glowing red eyes are part of the Kabal's uniform, yet do nothing but are cosmetic. Too bad this card is trash because the Mage Secrets are trash. But I love the animation and the voice. can anyone tell me what race/species the kabal crystal runner is? Blizz missed the chance for some Breaking Bad references here, should have put some kind of reference to 96.2% purity in the flavor text. Not as good as people think. Mage secrets are generally not very good and with Mad Scientist being a wild card, you can't justify running them in any Mage deck that isn't freeze. You have to play 2 secrets for it to have very good value, a 4 mana 5/5 isn't insane as everybody seems to think. 1 attack off Chillwind Yeti stats. Even if you get the reduction to 2 mana, at that point a 5/5 for 2 after sacrificing tempo and board presence is just bad. You would've have had to play 2 secrets turn 3 and 4 or 2 secrets turn 2 and 3 with the coin. Playing secrets back to back in itself is slow. The dream set up for this card is to play 2 Kabal Lackeys turn 1 with 2 secrets and then to top deck Kabal Crystal Runner. This would have 2 2/1 and 1 5/5 with 2 secrets in play. But even with this play, you've just depleted your whole hand as a Mage. The reason Thing from Below was played because you would still play your standard Shaman cards without having to play abnormally. The Thing from Below would be just a huge plus for playing normally. 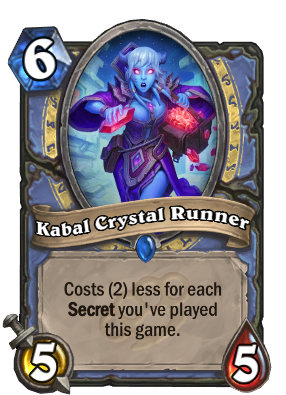 With Kabal Crystal Runner, you have to play in a way which is sub optimal for what is even a worse card because Thing from Below has taunt. This card is officially my best girl in this game.